Spend five minutes looking at Pinterest these days and you'll fall over bucket loads of Eclipse Cards - they seem to be really in fashion at the moment! They generally look pretty, feminine or delicate. So here's my masculine version - nothing pretty or delicate about it but I really like the way it looks sort of natural. It almost looks like a piece of the forest has found its way inside! 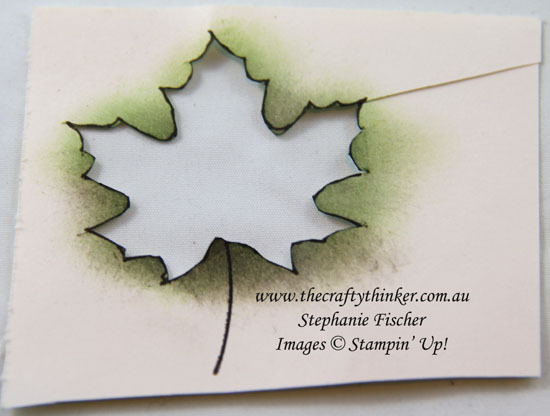 In retrospect - I probably didn't need to stamp the leaves onto the Wood Textures Designer Series Paper. I used Early Espresso ink to sponge around the edges of the Wood Textures layer and I also sponged around the edges of the negative spaces where the letters had been cut out - my theory being that it would add to the "hewn" look by providing a bit more definition once the letters were replaced and would also create a bit of shadowing. Have you ever wondered how something originated? Like - what made someone see some berries growing and think "If I harvest those, dry them, roast them, grind them and mix them with hot water it'll probably taste good"! If anybody is looking at this card and thinking, what made her think of adding that twig - the answer is that it was lying on my craft table and I thought "why not?"! It was cut from Smoky Slate card and I lightly sponged it with Early Espresso ink. I used Multipurpose Glue to adhere all the elements, sort of pressing down the leaves so that they almost molded to the lettering. 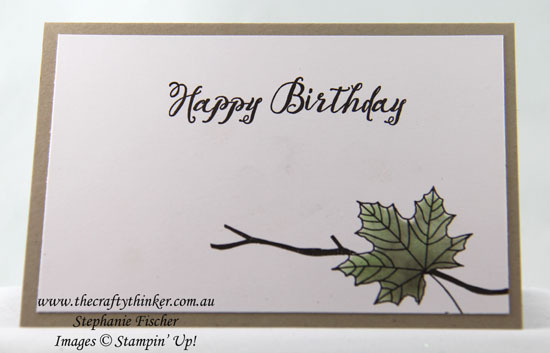 I stamped the leaf again inside the card, masked it and stamped the branch. I then removed the mask and carefully held the negative from making the mask in place while I sponged with Early Espresso and Wild Wasabi inks. Cut the piece to size for your card. 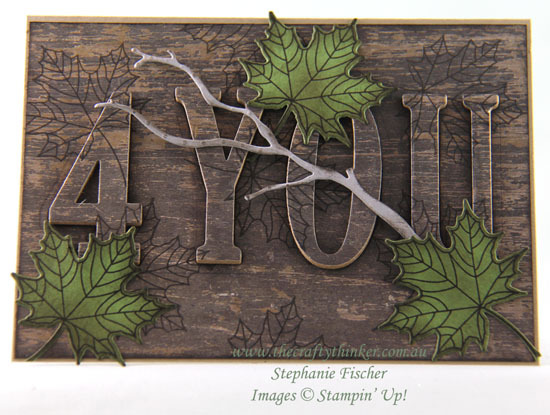 Glue the large piece (with the letters cut out) to your card base or mat. Glue the centres of the letters into position (eg in the number 4 and letter O above). The easiest way to do this is to hold the rest of the letter in place in the corresponding cut out area and the pop the glued piece into position. Once it's in position, remove the rest of the letter. 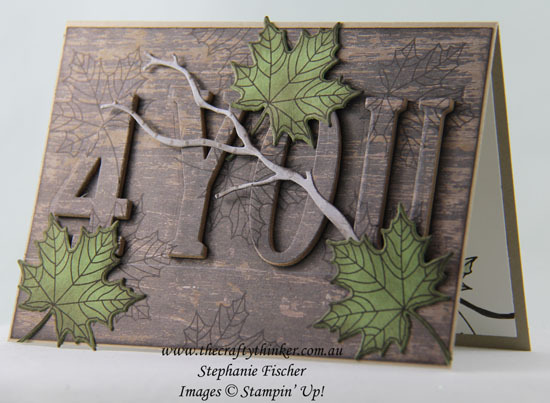 Cut more of the letters from cardstock or cardboard - the number of layers you need will depend on the depth you require and the thickness of the board you use. 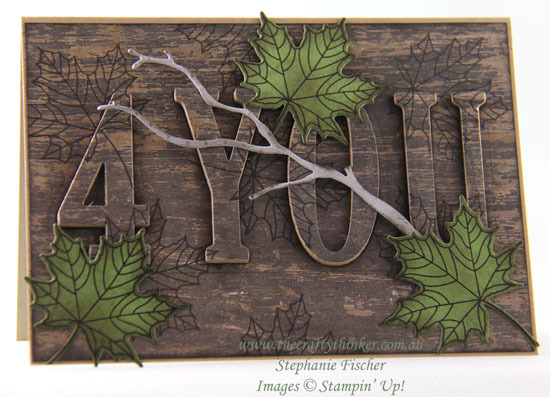 Glue the layers of letters together with the decorated layer on top. Tip: it pays to take some time to ensure that the layers are accurately stacked. Using a wet glue will give you more time to do this. I find the easiest method is to line the edges up between my thumb and forefinger, working my way around all the edges. Glue the finished, stacked, letters into position.